After a heated bidding war, ABC has landed a single-camera project starring Matthew Perry in one of the richest deals to date this development season. The untitled comedy — based on an idea by Matthew that he will write with Sony-based Alex Barnow and Mark Firek — became an instant hot property when it hit the marketplace this week, with ABC and NBC going toe-to-toe in pursuit of the show. Thomas Schlamme (producer and sometimes-director of West Wing, Sports Night and Studio 60 on the Sunset Strip) is attached to direct the comedy in which Matthew stars as a self-involved manager of a second-rate sports arena who begins to re-evaluate his life on his 40th birthday. 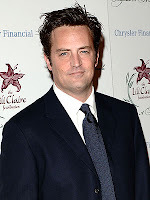 Matthew joins fellow Friends alumnus Courteney Cox's new network. Courteney stars in the hit ABC comedy Cougar Town.